Dosbat: Is Prince Charles Correct? So what has His Royal Highness said? "We're seeing a classic case of not dealing with the problem, because, I mean, it sounds awful to say, but some of us were saying 20 years ago that if we didn't tackle these issues, you would see ever greater conflict over scarce resources and ever greater difficulties over drought, and the accumulating effect of climate change, which means that people have to move. And, in fact, there's very good evidence indeed that one of the major reasons for this horror in Syria, funnily enough, was a drought that lasted for about five or six years, which meant that huge numbers of people in the end had to leave the land." The key question is whether there is support for this in the primary peer reviewed scientific literature, and there is. 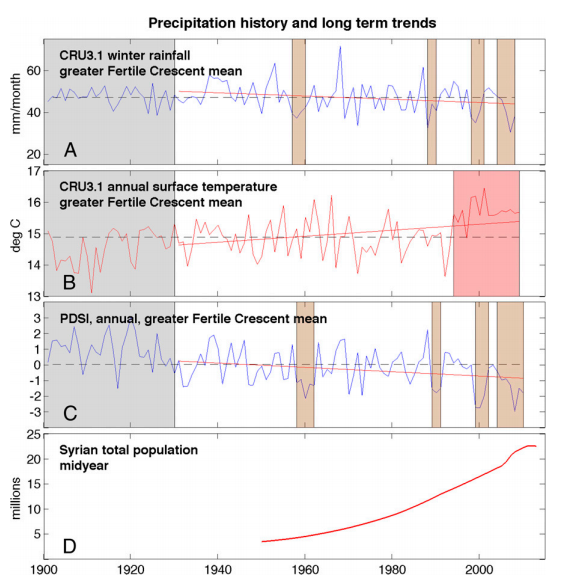 Early this year Kelley et al published a paper in PNAS entitled "Climate change in the Fertile Crescent and implications of the recent Syrian drought." PDF. Obviously natural variability plays a role but the trend of drying and warming is clear and it has the effect of shifting the drying, warming and PDSI short term fluctuation into something unusual. Note that temperatures in part respond as a feedback on soil moisture, energy lost from evaporation manifests as temperature increases once the soil is dessicated. However one thing is clear, the massive increase in population, and here an additional complicating factor demands consideration. Writing in The Ecologist in June this year Gianluca Serra argues that it is overgrazing that has caused the collapse of the ecology of the Syrian Steppe and has led to the mass movement of former farmers and nomads into urban centres which has contributed to the Syrian civil war. The Syrian steppe covers 55% of the country's territory. This vast steppe land, together with portions from Iraq, Saudi Arabia and Jordan, has been grazed sustainably by nomadic indigenous pastoralists (Bedouins) for centuries (if not more). Each tribe and clan was linked to certain seasonal pastures and this ensured the sustainability of the grazing - a practice finely calibrated on the need of plant regeneration. These pastoralists of Arabia are known to have been pioneers in establishing 'protected areas' (hema): certain pastures were relieved from grazing, permanently or temporary, in order to allow keeping the whole ecosystem healthy and functional. The beginning of the ecological degradation and destruction came with the modern state, so keen to uncritically import ideas of maximization of agricultural yields from the Soviet Union: in particular the central government decided to nationalize the steppe in 1958, establishing de facto an open access system - a well known recipe for ecological disaster. Through this arrangement the customary link between the natural resource and its user was interrupted - abruptly disowning the traditional ecological knowledge of this ancient people. The pastures, not managed and protected anymore by the tribes, started to be over-grazed by free-ranging pastoralists. He also notes that in eastern Syria wealthy investors put money into irrigation driven intensive agriculture, following the 2006 to 2010 drought government subsidies were abruptly stopped after a period in which fuel prices had risen leading to this system collapsing. And he refers to sustainable nomadic peoples being restricted by the formation of nation states. Pierre Gosselin of the ironically entitled No Tricks Zone blog enthusiastically runs with a Der Speigle article and totally dismisses the Kelley et al finding. However, although I don't wholly disagree with the points Der Speigle raises, quotes from those scientists merely represent another set of scientists who disagree of whom not least are the authors and the reviewers who obviously considered Kelley et al to be worth entering into scientific discourse. It seems to me to be foolish to dismiss the arguments of Kelley et al. But Gianluca Serra introduces more complexity. And at the same time there is the complex interplay of increased fuel prices driving increased food prices as one causal role driving the Arab Spring uprisings. Those uprisings had a domino effect after the Tunisian Revolution of December 2010 and this was highly likely to have played a role in the degeneration of Syria into its current parlous state. So is Prince Charles correct? Climate Change and the desertification of the Syrian steppe likely plays a role in the current Syrian crisis along with likely contributions from the collapse of Iraq, increased fuel prices, the Arab Spring, and land use changes caused by the development of nation states in the region, and investment in agriculture. This is not an exhaustive list. But it seems reasonable for him to suggest that "one of the major reasons" is indeed Climate Change, however there are many factors. If we want to see clear primary causal roles for Climate Change in such disasters as Syria we need only continue business as usual, next year CO2 levels will likely surpass 400ppm, in around ten years at current emission rates we will be half way to a doubling (560ppm) from pre-industrial CO2 levels (280ppm). However, excepting specific regions like the Arctic, in most parts of the world the signature of Climate Change is still of the same order of magnitude as natural variability and primary causal roles cannot be claimed, not that Prince Charles is claiming a primary role in Syria.